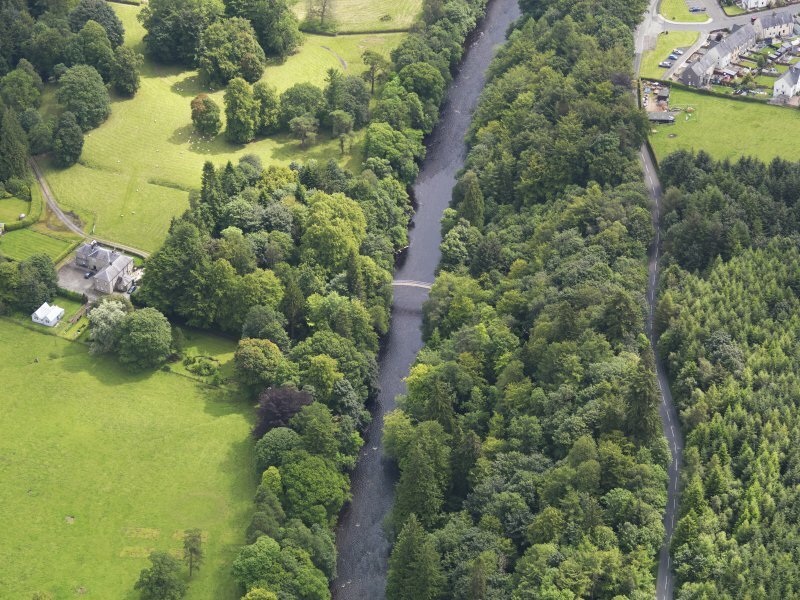 General oblique aerial view of Langholm Lodge Duchess Bridge, taken from the WNW. Detail of underside showing construction. 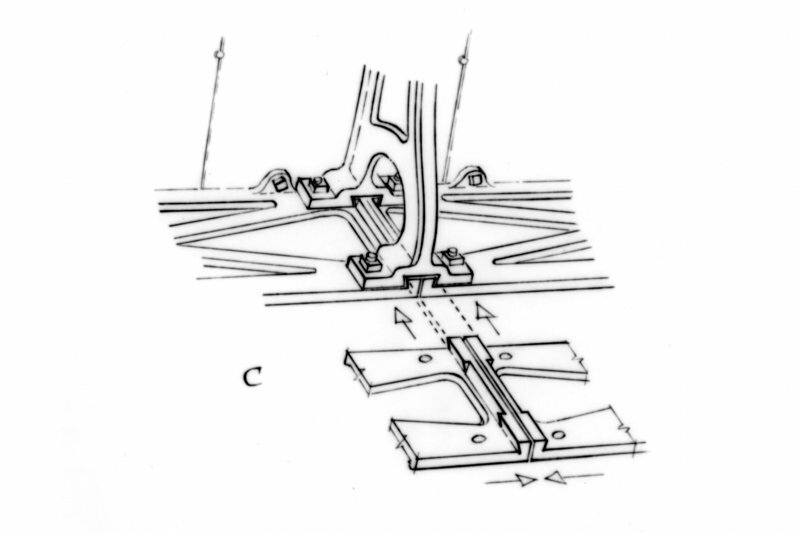 Detail of dovetail joint between transverse rib and adjacent arch ribs. View of centre portion from downstream. Duchess Bridge: a cast-iron footbridge over the Esk, designed by William Keir, junior, and erected in 1813. Elegant lattice-girdered segmental span, the railings of the balustrades tied down by iron scrolls to the projecting deck. Duchess Bridge, 1813, William Keir Jnr. 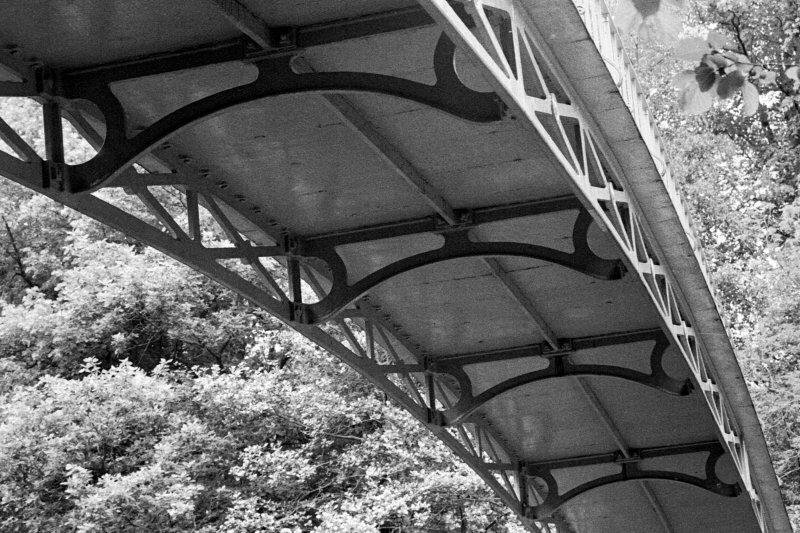 Early, fine and remarkably slender cast-iron arched footbridge. This bridge carries an estate footpath across the River Esk to the S of Langholm Lodge (NY38NE 31.00). Information from RCAHMS (RJCM), 20 March 2006. 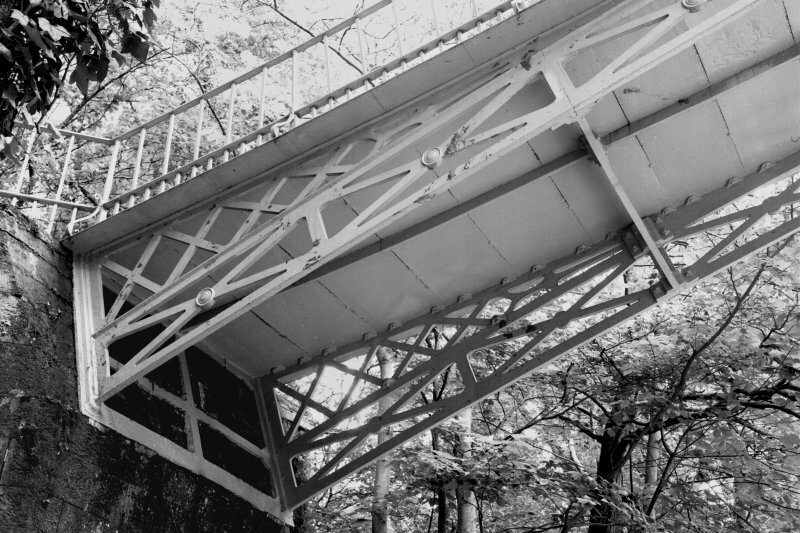 A cast-iron footbridge over the Esk, designed by William Keir, junior, and erected in 1813. This site has only been partially upgraded for SCRAN. For full details, please consult the Architecture Catalogues for Annandale and Eskdale District. 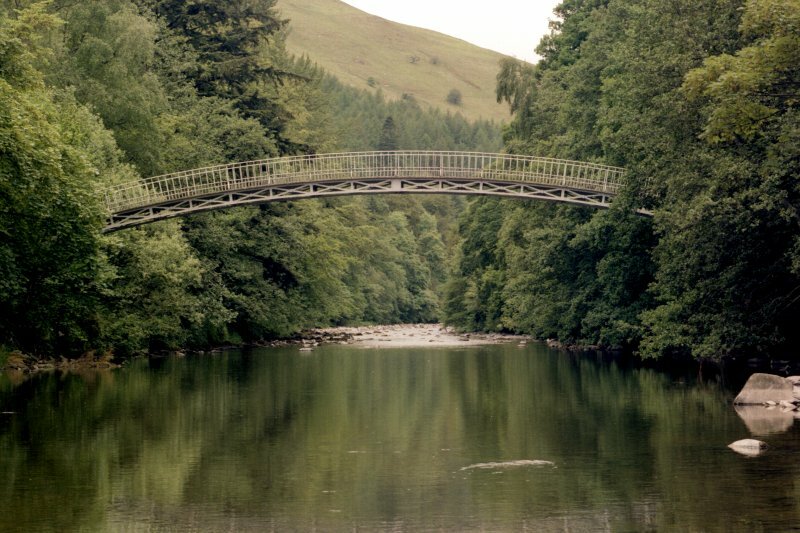 This footbridge, which can lay claim to being the oldest surviving cast-iron arched bridge in Scotland, forms part of a pleasant riverside walk on the northern outskirts of Langholm. It crosses the River Esk to serve Langholm Lodge, a former residence of the Dukes of so Buccleuch, hence its name. It was designed by William Keir, Director of Works on the Duccleuch estate, and was built in 1813 with iron cast in Workington. It is now somewhat hidden by trees and no longer, as in 1835, the 'object of great attention to travellers as they enter the town by the north'. 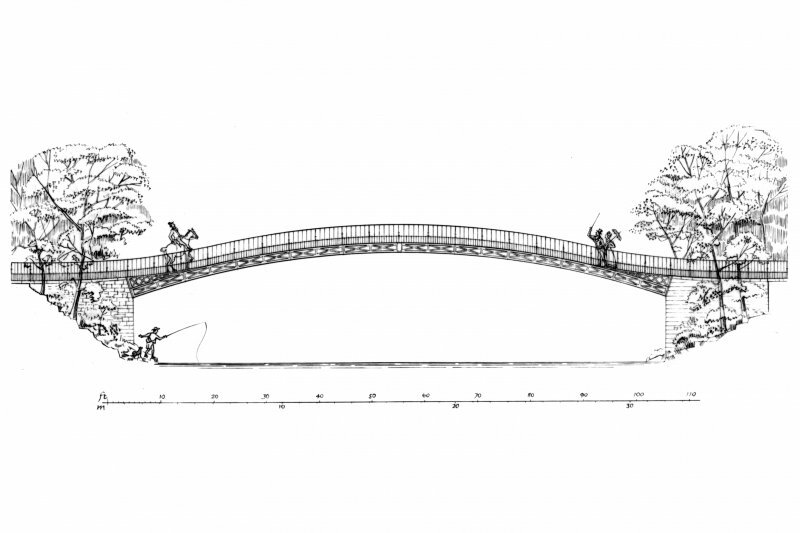 In construction it is closely comparable to the famous Telford-designed road bridge at Craigellachie (1814-15), albeit simpler and of a smaller scale. 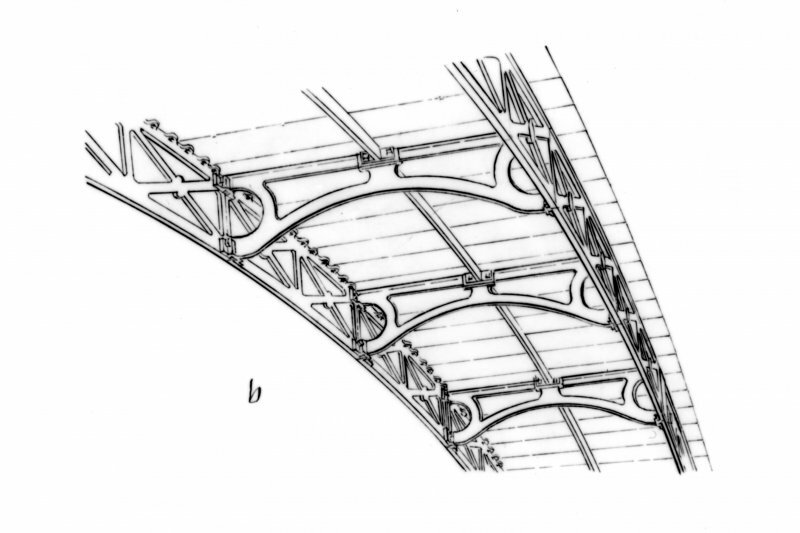 Its arch, which has a clear span of 30.7m, is set within masonry abutments, and is made up of sectional archribs and transverse ribs of cast iron connected by interlocking dovetailed joints. 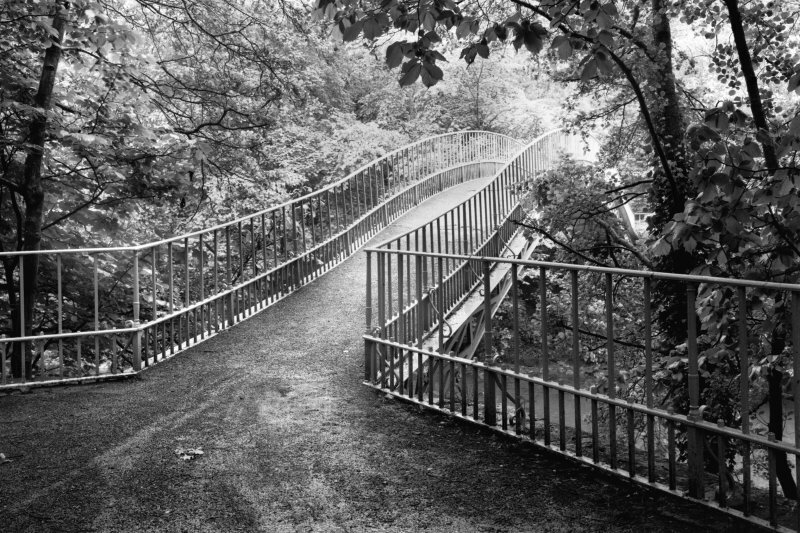 A cast-iron arched footbridge forming part of a riverside walk over the Esk on the Buccleuch Estate at Langholm. It has a span of 104 ft, a rise of 6 ft, is 6 ft wide and is one of the finest early examples of its type. The ironwork was made in Workington, Cumbria and transported and, according to the Estate records, erected on site in Autumn 1813. 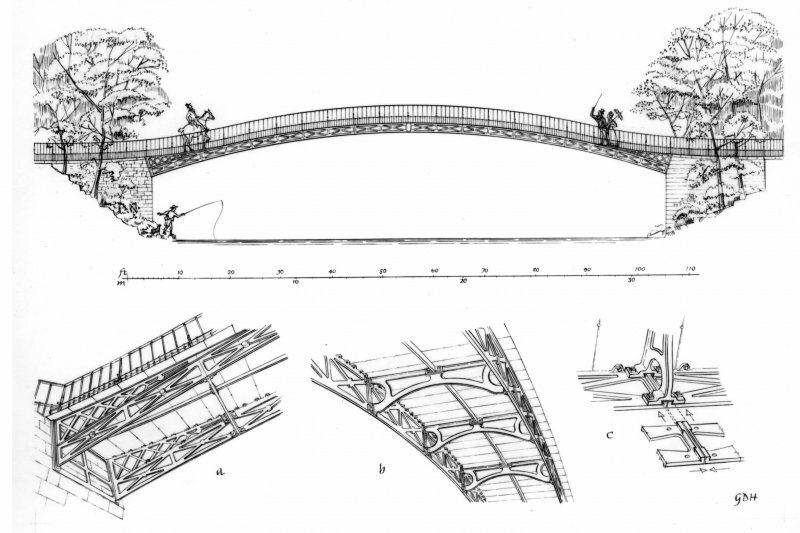 The bridge is understood to have been designed by William Keir, Jnr. 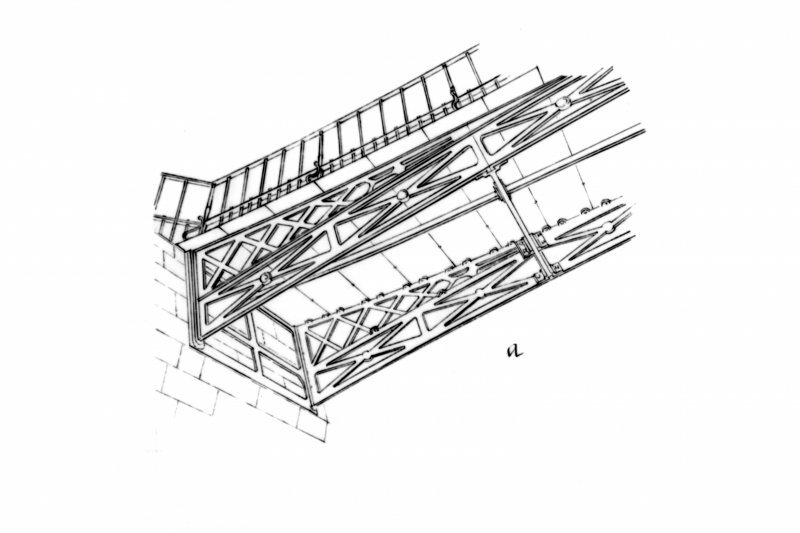 A Telford influence in its graceful elevation is suggested by its cruciform rib form, radial orientation and handrailing. 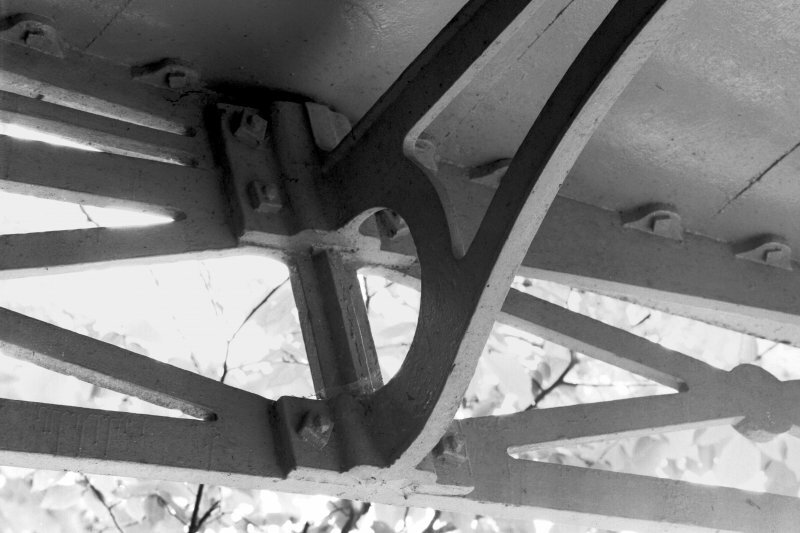 In detail the bridge exhibits the independent artistry of its designer.